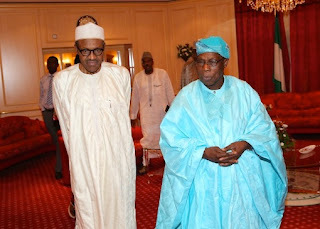 Former President Olusegun Obasanjo says President Muhammadu Buhari may not do well in economy and foreign affairs, except in military matters. “Buhari is not a very hot person on the economy and foreign affairs,” Obasanjo said. The former President stated this on Monday at the third International Conference on African Development Issues — themed, “Driving inclusive and sustainable development in Africa: Models, methods, and policies” — organised by Covenant University, Ota, Ogun State. While reacting to a question posed to him by a member of the audience: “Is there any hope for Nigeria under the administration of President Muhammadu Buhari?”, Obasanjo replied, “Is there any hope for Nigeria under this administration? I came back from Geneva, Switzerland a few days ago to attend a conference titled, ‘Are elections giving democracy a bad name?’ We had an election; we elected a leader and the good thing about democracy is that the power you have to elect a leader is also the power you have to remove him. I am saying this because I said earlier that if you don’t see any leader that has done well in the 56 years of Nigeria’s independence, then let us forget about Nigeria. The former president also said he tried his best in fighting corruption, especially in the recovery of funds looted by the late Gen. Sani Abacha and that as of the time he left the government, about $1bn was still to be recovered. Obasanjo said, “For me, we have no hope if we have no future. I am an optimist as far as Nigeria is concerned. If somebody doesn’t get it all right for now, we will get somebody who will come up and fix whatever is missing. The administration before this had no clue on how to deal with Boko Haram; there is no doubt about that. Obasanjo added that fighting corruption would not be effective if it did not translate to a better life for the citizens. Other speakers at the event included Nigeria’s Permanent Representative to the United Nations, Prof. Joy Ogwu, and the Associate Vice-President, Research, McMaster University, Canada, Prof. Bonny Ibhawoh. They both said if Africa was to experience any development, leaders must match their words or policies with action.